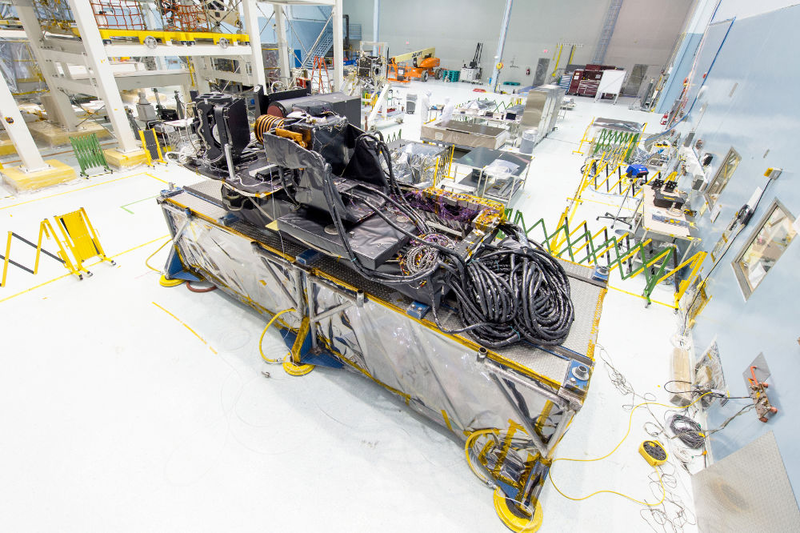 As the Dec. 2020 launch date for Landsat 9 approaches, scientists and engineers are busy building the two science instruments that will fly aboard the satellite. The Thermal Infrared Sensor 2 (TIRS-2) is one of these instruments and it is being built at NASA’s Goddard Space Flight Center in Greenbelt, Maryland. TIRS-2 is a thermal sensor that will make measurements in two sections, or bands, of the thermal infrared portion of the electromagnetic spectrum, enabling land surface temperature measurements to be made. The instrument uses the same technology as its predecessor, Landsat 8’s TIRS instrument, exploiting principles of quantum physics to make measurements of long-wave (thermal) infrared energy. TIRS-2, however, will have a 5-year design life (opposed to the 3-year design life of TIRS) and there have been strategic optical design changes (namely baffles) for TIRS-2 to avoid the stray-light issues that have complicated measurements made by Landsat 8’s TIRS. The photographs shown here give us a peak into the progress of the TIRS-2 build, which, as with any science-grade space-based instrument, involves lots of testing. 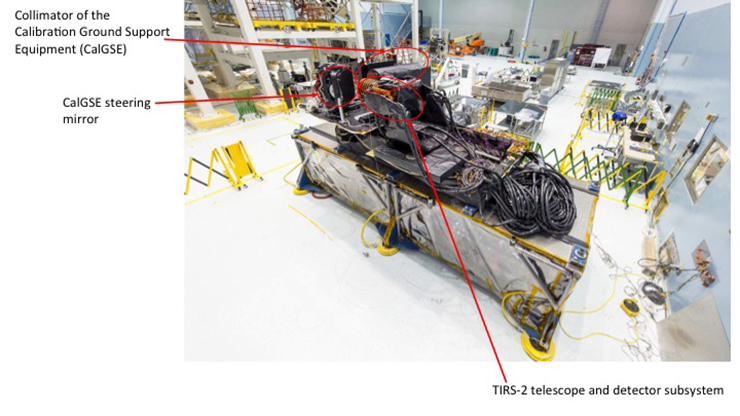 The TIRS-2 instrument is a push broom sensor (like Landsat 9’s other science instrument, the Operational Land Imager 2). Its focal plane has long arrays of photosensitive detectors. Its pixel size will have a spatial ground resolution of 100 m (328 feet), with 1850 pixels spanning Landsat 9’s 185 km swath width. TIRS-2 uses a four-element refractive telescope that focuses an f/1.64 beam of thermal radiation onto a focal plane that is cryogenically cooled. The TIRS-2 focal plane holds three modules with quantum-well-infrared-photodetector (QWIP) arrays arranged in an alternating pattern along the focal plane centerline. A two-stage mechanical cryocooler will cool TIRS-2’s focal plane. This permits the QWIP detectors to function at their required temperature of 43 K (-382° F/ -230° C). There will be two radiators mounted to the side of the TIRS-2 instrument structure. One dissipates heat from the cryocooler and the other passively maintains a constant TIRS-2 telescope operating temperature of 185 K (-127° F/ -88° C). In mid-February, and ahead of schedule, Ball Aerospace delivered the TIRS-2 cryocooler. The early delivery of the cryocooler is highly significant because a number of design challenges prevented an on-time delivery of the original Landsat 8 TIRS cryocooler. TIRS-2 photos shown herein cleared by the NASA Export Control Office; photo context provided by TIRS-2 scientist Joel McCorkel.